Situated at 33rd and Ellerslie in the middle of Baltimore, this stadium is famous for it's tailgate parties and high volume fans who supported a hard hitting team. Completed in 1953 at a cost of over $6 million, with a seating capacity of of almost 50,000, this then modern double-decked stadium was the home of Major League Baseball's American League Baltimore Orioles and the National Football League's Baltimore Colts. Memorial Stadium has a surface called SportTurf. The base is concrete and matting. Grass is planted and allowed to grow and be the top level of the turf. The Baltimore Colts beat the Dallas Cowboys 16-13 on January 17, 1971 in Super Bowl V in Miami. John C. Duff writes: I am 35 years old, and I was born in Baltimore. My father used to take me to see the Baltimore Colts play in Memorial Stadium, which as you know is closing this year. To be honest with you, I don't know what they are are going to do with Memorial Stadium. I live in Virginia now, and don't get to watch Baltimore news, so I haven't any idea. It probably won't be used for anything, and it is likely someone will buy the property and tear down the stadium. The area it is in is just north of the Johns Hopkins University campus. The local neighboorhood is sort of a modest, residential area with red brick rowhouses, and it is sort of off the beaten path, so I don't know what they would do with it. But I will always remember creeping in traffic down 33rd St. with my father on the way to the game on a Sunday afternoon . . . the roar of the crowds as we walked closer, rushing to not miss the kickoff . . . walking up the ramps to the upper deck and catching a glimpse of the green grass, and the Colts in their brilliant royal blue and white uniforms. An interesting fact about Memorial Stadium in the late 60s/early 70s: During those years the Orioles had some great defensive teams, with three or four perennial 20 game winners (McNally, Dobson, Palmer, Cuellar), and great fielding infields (Powell at first, Davey Johnson at 2nd, Mark Belanger at shortstop, and the great Brooks Robinson at 3rd). The Orioles used to have the grounds crews cut the grass very, very short, so the ball would get to their infielders quickly to turn double plays. Mike Cuellar, an Orioles lefthanded junkman used to throw about 20 groundball outs a game . . . I think he owed Brooks Robinson about half his paycheck. Anyway, after the first good frost each October, the grass would die, and by the time November rolled around, the Colts would be playing their games on brown dirt. Watch some of the old highlight films of late season games and you'll see what I mean. The wind would swirl the dirt around. In 1970, the Colts played the Raiders for the AFC Championship in December. The game became known as the dust bowl game, because of the swirling dust and wind. I think the Colts won and went on to beat the Cowboys in the Super Bowl that year. December 19, 1976. The Colts were playing the Steelers in a first round playoff game. I am pretty sure the Steelers were the defending Super Bowl Champs. My uncle got five tickets for himself, my aunt, my brother, sister and I. Associated Press - Three things about Memorial Stadium which are relevant to this story. One, it is a horseshoe shape, with an upper deck about halfway around the horseshoe, so in the closed end of the field it got really loud. I mean really loud. ( It was nicknamed the worlds largest outdoor insane asylum, and opposing quarterbacks' signals could not be heard). Second, Sunday games could not start before 2:00 pm, because until recently Baltimore had some bizarre blue law which stated that no public event could take place before 2:00 pm on a Sunday. This played havoc with the network football coverage and scheduling back then. Third, in memorial Stadium, if you had tickets in the first five or six rows off of the field, you couldn't even see over the heads of the players on the bench. It was because of this that the Colts rarely sold out, because local fans knew tht those seats were no good for seeing the game. Anyway, we had seats in the 6th row at about the 40 yard line, and you could see about half of what was going on. We got there about 20 minutes before kickoff, and the crowd was making ungodly noise, because it was the first playoff game in Baltimore since the 1970 Championship game against the Raiders (the dust bowl game). Baltimore kicked off into the closed end, and they stopped the Steeler return man at their own 15 yard line which prompted the crowd to make even more noise. The great Terry Bradshaw (now on Fox) led the Steelers out amid deafening crowd noise. As Bradshaw took the snap, on the near sideline, right in front of us, Lynn Swann took off straight down the sideline on a fly pattern with the Colts' cornerback (I think it was Nelson Muncey but I'm not sure) stride-for-stride with him. Bradshaw just heaved the ball down field with the two running down the sideline under it, and as the ball reached its highest point, the Colt cornerback tripped, and Swann ran under the ball in stride and caught it for an 85 touchdown on the first play from scrimmage. As the ball landed in his hands downfield, with no one within 20 yards of Swann, the crowd noise went from deafening, to completely silent. Soon all of these memories will exist only in the minds and hearts of the old Colts faithful. Each year there will be fewer and fewer of us around. Thank you for preserving these memories. On October 20, 1998 Rich wrote: I've heard that Memorial Stadium contains urns of earth from every foriegn country that U.S. soldiers fought in. Is there any truth to this? Where can I find this history if it is true? December 1998 - The City of Baltimore has put out an ad for a "Development Opportunity" that will accept proposals for the site of 29.5 acres. BALTIMORE (AP) -- Ravens fans grilled sausages, drank beer and swapped stories about teams old and new Sunday before the final football game at Memorial Stadium. "I'd better make sure I have my Kleenex," said Pennie Bailey, 75, of Shrewsbury, Pa., echoing the sentiments of many fans expecting an emotional farewell. "I'll need them. There's lots of memories in this place." Bailey held season tickets to the Baltimore Colts for 26 years, paying $7 for her first season. That's $7 for the entire season, some $13 less than it cost to park Sunday. Like many fans, Bailey never got to say good-bye to the Colts, who were spirited off to Indianapolis under the cover of darkness in 1984. "I spent many wonderful Sundays here," she said, dabbing tears from her eyes two hours before kickoff. "My son started coming with me when he was 5; he's 45 now. It kind of chokes you up to talk about it." Mark Engle, 36, of Arnold, Md., had similar memories of attending Colts games with his father. However, now that he's a Ravens fan, Engle is ready to begin a new customs when the Ravens move into their new home in 1998. "I'll miss some of the history, but I think it's time to go to the new stadium," Engle said. "I'm excited about it -- I go out of my way to drive by it whenever I come into the city. I like to see the progress." Progress aside, there were plenty of memories of the old Colts in the parking lots across from the 43-year-old stadium before the finale against the Tennessee Oilers. Ironically, the Colts' final game in Memorial Stadium was against the then-Houston Oilers. Butch Ergott of the Reisterstown group wore two ski caps -- a worn Colts version, circa 1966, over his purple Ravens issue. Other fans hauled old Colts sweatshirts out of their closets. More than a few No. 19 Johnny Unitas jerseys were spotted among the revelers. That brought back memories for former Colts players like Jim Parker, a Hall of Fame offensive tackle who played in Baltimore from 1957-67. "We learned how to be a family," said Parker, noting the special relationship between players and fans. "That was our tradition." "The players in those days made you feel like you were a part of the game," added Bailey. Not everybody, however, was sorry to see the final game at Memorial Stadium. "This place cost us a football team and almost cost us the Orioles," said John MacKenzie, 31. "Just because it's old and historical doesn't mean it's necessarily a good place. It's time to change." BALTIMORE (Associated Press) -- Baltimore has settled on a plan to demolish Memorial Stadium next year to make way for a 446-unit senior housing development and a recreation center. City Housing Commissioner Daniel P. Henson III announced the decision on Wednesday, ending some three years of debate about the fate of the abandoned, 46-year-old stadium and its 30 acres of prime real estate. Completed in 1953, the northeast Baltimore stadium has been vacant since Dec. 14, 1997, when the Baltimore Ravens played their last football game there. The team moved across town to a $223 million stadium south of the baseball park at Camden Yards. Memorial Stadium was once the heart of Baltimore's sports universe. John Unitas threw his final touchdown pass for the Baltimore Colts there. It's where the Orioles clinched their second World Series championship, and Frank Robinson ripped a home run completely out of the ballpark -- the only player to do so. "I remember the first time I went to watch a football game at Memorial Stadium, when I was 12 or 13 years old," Henson told The (Baltimore) Sun. "But all of us recognize that this is a building that is going to fall down on us at some point, and we need to let it go." The plans for the senior citizens' housing project, which Mayor Kurt L. Schmoke talked about during his weekly news conference Thursday, represent a victory for community groups that lobbied for the recreation center and housing. Residents opposed two alternative developments -- a high-tech center and a retail complex -- fearing they would bring traffic. The nonprofit Govans Ecumenical Development Corp. (GEDCO) will have until Nov. 8 to obtain financing for the $43 million project and conduct a study to convince the city that there is enough demand among senior citizens for housing, officials said. No city money will be used for the project. If the developer clears these hurdles, the city will sell some of the land to the developer and demolish the stadium in early 2000. The state has committed $10 million to help tear down the structure. State Comptroller William Donald Schaefer said Thursday the decision should have been put on hold. "It is not fair for the current administration to saddle the state or the next mayor with decisions as important as these," he said. 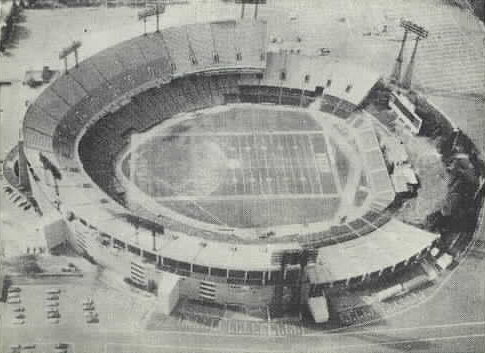 BALTIMORE -- The wooden seats, the lockers, the no-parking signs, even the goalposts were sold off last fall to Colts and Orioles fans in love with their memories of Memorial Stadium: first dates, fireworks, Johnny Unitas throwing for touchdowns, Frank Robinson drilling that home run. And the old place, dignified in a staunch 1950s kind of way, with its vast facade of marching steel letters honoring World War vets -- "TIME WILL NOT DIM THE GLORY OF THEIR DEEDS" -- was left to await the wrecking ball. Baltimore was moving into the future. A $43 million retirement community and a recreation center were scheduled to rise in the stadium's place. Then, late last year, something odd happened at the State Board of Public Works. Just days before the long-planned razing work was expected to begin, two of the three board members, Maryland Treasurer Richard N. Dixon and Maryland Comptroller William Donald Schaefer, balked at signing off on the $2.6 million demolition contract. The Maryland Stadium Authority was forced to take the contract off the agenda. And since that day in November, the stadium has waited in limbo. This morning, the board meets again. Many people will be watching with bated breath. There are the stadium neighbors and supporters of a prominent church-based North Baltimore nonprofit who want the old stadium leveled so the organization can build Stadium Place, an affordable-housing and assisted-living project for 500 seniors. "What we will have is a living tribute to the veterans," said Julia Pierson, executive director of the organization, Govans Ecumenical Development Corp.
And then there are the neighbors, veterans, preservationists and officials who believe that the brick-and-concrete stadium on 33rd Street is not a white elephant at all, but a temple of sorts to a vanishing time. Those defenders of Memorial Stadium are waging an eleventh-hour campaign to save it, and many have placed their hopes in the revival of a Johns Hopkins University plan to develop a research park on the site, using the old stadium as its centerpiece. Johns Hopkins respects the process by which the city selected the Govans project for the site, said university spokesman Dennis O'Shea. But, he added, "if, at the end of the day, the GEDCO project doesn't go through, we'd take another look." Such a commercial use could provide a new economic engine for the center city neighborhood, much as the stadium did in its heyday, advocates say. There is also a prevailing sentiment among them that ever since 1949, when the ballpark was first conceived as Memorial Stadium by the city's Gold Star Mothers; that ever since 1953, when the letters of its 80-foot stainless steel eulogy were fabricated; that ever since opening night, April 15, 1954, when Clint Courtney of the Orioles hit the first home run, Memorial Stadium has been more than a stadium. "Reason number one the preservation folks are interested: You don't tear down war memorials," said Jamie Hunt, development and communications director for Preservation Maryland, a Baltimore-based organization dedicated to saving historic sites. "You don't tear down monuments," echoed Jim Clifford, a World War II veteran and past commander of the neighborhood American Legion Post. Under the demolition plan, some of the steel letters and the urn of soil gathered from all the veterans cemeteries of the world would be salvaged and taken to a new veterans memorial at Camden Yards, where the Orioles moved in 1991. It wouldn't be the same, insisted Clifford. "They are not interested in a memorial like we have on 33rd Street." Among the pro-demolition, pro-senior-housing forces, the thinking is different: Govans is made up of church people. They understand sacred objects. And they understand the spirit as movable, manifesting itself in God's people, God's work. "When a church closes down, you take your holiest objects and you move them to the new one," Pierson said. Maybe an entire memorial wall can't be kept, she said, "but the essence of it can be moved elsewhere." John C. Nuttle, a Govans board member and a veteran, agrees. In recent weeks, he has heard a lot about the memories of the good old days, "the old Colts, the old Orioles days." "The people who remember that can live there," he said. Nuttle, a retired Rouse Co. administrator who is active in an Episcopal church, points to the work Govans has already done housing the old, the poor, the frail and the mentally and physically disadvantaged in six projects across the city. Govans has a $5.2 million commitment from the U.S. Department of Housing and Urban Development. But the delay in tearing down the stadium is hurting the nonprofit's ability to raise additional funding, Nuttle said. "We don't have the land. The city has to turn over a cleared site." City officials, including Mayor Martin O'Malley (D), who have supported the Govans project are now waiting for the State Board of Public Works to act. "We're placing our fate in the hands of the Board of Public Works," said O'Malley spokesman Tony White. " And late yesterday, given the tumult on the board, not even Edward Cline, deputy director of the Maryland Stadium Authority, knew whether the demolition would remain on the agenda for today's 10 a.m. meeting. "I might not find out until 9:55," he said. There are three votes there. One belongs to Gov. Parris N. Glendening (D), a supporter of demolition and of Govans. One belongs to comptroller Schaefer (D), a former governor and Baltimore mayor, who has come out against the demolition and the Govans project. "We're going to fight it all the way down to the wire," Schaefer pledged. He is a veteran himself but says he favors the research park idea for financial reasons. He also likes Johns Hopkins's plans to incorporate the stadium with its memorial wall. "The veterans . . . they deserve that." Then there is the swing vote, belonging to treasurer Dixon (D). At the November public works board meeting, he said he could not move forward with the demolition until he had more time to discuss concerns held by some members of the local legislative delegation. Yesterday afternoon, he wouldn't say what he would do. "He's still discussing the matter," said his spokeswoman, Brenda Walter. One delegate who has come out against the demolition is Kenneth C. Montague Jr. (D), a 26-year resident of the Waverly neighborhood, where the stadium is located. He is hoping for time, hoping "to work out a compromise." Why can't there be some housing, a recreation centera research park, Montague asks. "On a thirty-acre site, we could do it all and preserve the memorial and the lettering," he said. For now, the stadium stands, square-shouldered, silent in the cold. The Ravens played there in 1996 and 1997, before they got their new stadium. Now they are in the Super Bowl, and everyone in Baltimore seems to be wearing purple. Anna Mae Becker, 68, a Johns Hopkins nurse who lives near the stadium and who has become involved in the effort to save it, hopes somehow the nostalgia and spirit will rub off on the old place. "It would be so disrespectful to tear it down," she said. "They should be putting purple lights on it." Built originally in 1949-1950 and immediately the subject of modification and expansion, in 1954 Memorial Stadium became the official home of the American League's Baltimore Orioles and the National Football League's Baltimore Colts. Since that time, Memorial Stadium has hosted the Canadian Football League's Stallions and the Baltimore Ravens. When the Ravens left in 1998 for their new home at Camden Yards, planning to determine the future of this grand old facility began in earnest. The City of Baltimore is currently negotiating with the Govan's Ecumenical Development Corporation (GEDCO) for Stadium Place, a senior citizen housing development. The Maryland Stadium Authority has responsibility for overseeing demolition of the Stadium. Environmental remediation and salvage operations have been performed. Working closely with representatives of the Babe Ruth Museum, MSA began removal of seats and other memorabilia from the stadium in 2000. Items ranging from rest room signs and police call boxes to lockers and ceiling fans were unearthed. 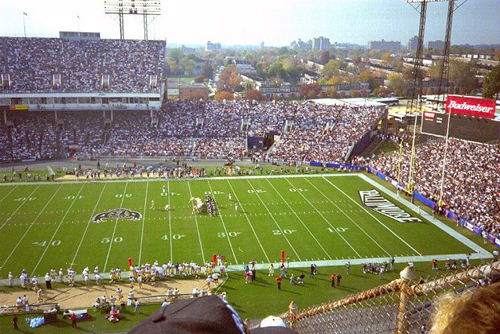 In October, 2000, a public sale and auction was held at Memorial Stadium affording lifelong Baltimore Sports fans an opportunity to obtain a special memento of the grand old stadium and generating revenues to offset demolition costs. Demolition of Memorial Stadium began in February, 2001. September 23, 2000 Ray Knowles and Laine Malcotti wrote: I just returned from Memorial Stadium where today the sale of memorabilia and stadium kitsch took place. My husband and I waited in line for three hours along with many other people. The time flew by as we traded Baltimore Colts, Orioles, CFL Colts and Stallions and Ravens stories. As we wound our way around the stadium, the anticipation grew. Finally we could catch a glimpse through the center field fence. I gasped. There weren't any seats. The grass was gone and weeds grew up everywhere. The pennant flags were gone and the scoreboard was silent. But when I looked harder, there was a crowd cheering as loud as they could at a Lydell Mitchell 20-yard run or a Cal Ripken blooper to right. There I was in the bleachers with my cooler full of drinks that we were allowed to bring in. Once inside I looked long and hard. I picked out the chair I wanted, got in another line, paid and left. Today brings home the meaning of Memorial Stadium. It will be torn down in November. (The public can buy bricks for $25.) Thanks for the memories.